Let us search for possible equilibrium points of the mass in the rotating reference frame. Such points are termed Lagrange points. Hence, in the rotating frame, the mass would remain at rest if placed at one of the Lagrange points. It is, thus, clear that these points are fixed in the rotating frame. Conversely, in the inertial reference frame, the Lagrange points rotate about the center of mass with angular velocity , and the mass would consequently also rotate about the center of mass with angular velocity if placed at one of these points (with the appropriate velocity). In the following, we shall assume, without loss of generality, that . Because the term in brackets is positive definite, we conclude that the only solution to the preceding equation is . Hence, all of the Lagrange points lie in the - plane. is assumed to be a small parameter. where is assumed to be a small parameter. and specify the positions of the Lagrange points designated and . Note that the point and the masses and lie at the apexes of an equilateral triangle. The same is true for the point . We have now found all of the possible Lagrange points. Figure: Masses and , and the five Lagrange points, to , calculated for . 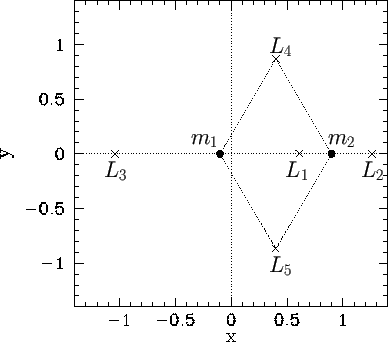 Figure 9.6 shows the positions of the two masses, and , and the five Lagrange points, to , calculated for the case where .